AI and machine learning are being used in almost every industry, and the oil and gas industry is no exception. Want to know the various ways in which the oil and gas industry is adopting AI? 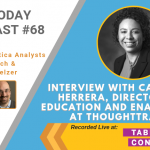 Listen to this podcast as Cognilytica analysts Kathleen Walch and Ronald Schmelzer interview Catalina Herrera, Director of Education and Enablement at ThoughtTrace, a company applying AI to processing documents many decades old.